The subject of kids and media -- how much they consume, what's "good" for them, what parents' role should be -- is a broad and complicated topic. New studies are continually released with a wide range of advice and information. More than a third of parents have learned something technical from their child. Most believe that video games help children foster skills that are important to their academic achievement. 57% recognize that digital media presents ways for children to converse and connect with friends and family. Those are just some of the positive perspectives from the report. But it's a lot more nuanced than that. Here's more about the study. A majority of American parents say they are concerned that digital media is interfering with childhood development. Yet most do not think their own children spend too much time with electronic devices. About 59 percent of parents say their children’s digital media use prevents them from getting physical exercise. More than half (53 percent) say the media use can pose a threat for online safety and privacy. About 40 percent of parents say digital media infringes on time their children would otherwise spend in face-to-face interactions. 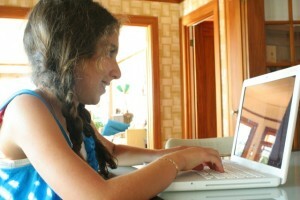 Only 18 percent of parents believe their own children spend too much time with digital media. Why the apparent contradiction? Researchers say it’s likely because the nature of digital devices today is more private and portable. Parents may not be aware of just how much time their little ones are spending in their rooms, using social networks or playing video games. Some childhood experts said the findings are not surprising, considering earlier reports on media use. Children ages 8 to 18 are spending an average of 7½ hours a day with digital media, includingTV, computers and video games, according to a study released last year by the Kaiser Family Foundation. Parents need to consider what sort of activities their children are missing out on when they spend so much time with electronics, said Peter Mangione, co-director of the Center for Child & Family Studies at WestEd. The San Francisco-based nonprofit provides research, development and services to improve learning outcomes. While many groups have blamed digital media for hindering family relationships and infringing on children’s physical activities, the Cooney Center researchers are cautiously optimistic about its potential to educate. Takeuchi added that social media can help expose children to other cultures and viewpoints. But, she said, that potential will be realized only once television producers, video game makers and other media producers create better-quality educational programs. Unlike movies and TV shows with broader appeal, many video games tend to target just children or adults. There is an optimal period, around the time when children are 6 or 7, when they want to engage in games with their parents and could stand to learn something, Takeuchi said. In the report, she made recommendations to those in the industry to innovate and create new programs and applications that would give children a chance to use their digital media to socialize, exercise and play with others. As for her advice for parents, Takeuchi suggests that they make screen time into family time by watching TV or playing video games with their kids. That would help inform parents about how much digital media their kids are consuming and make it a more enriching experience.